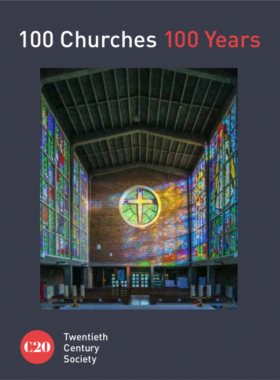 The claim will be made by Catherine Croft, Director of the Twentieth Century Society, at the launch tonight (26 March) of the charity’s book ‘100 Churches 100 Years’, which traces the development of modern church architecture in Britain from 1914 onwards. “Almost every Parish church in the country has some C20 element, yet our image of what a ‘historic church’ is, remains stuck in previous eras, probably with gothic arches and crumbling stonework, “ says Catherine. “We overlook some amazing fittings in all sorts of exotic materials, and some extraordinarily innovative entire buildings. It’s hard enough to fundraise to repair a traditional church, generating funds for a modern one is even more challenging. Unless attitudes change rapidly we risk losing a whole chapter of our heritage. “The churches, cathedrals and chapels we have chosen to include in the book are among the most inspiring and intact examples in the country. Some remain complete with the art, artefacts, stained glass and textiles designed for them. Many churches have not been so lucky. Ongoing maintenance, redecoration or incremental alterations – usually on a tight budget – to meet changing needs mean that many fine designs have already been compromised. In fact many C20 churches are more adaptable to less formal worship and to many sorts of non-religious use than older ones, and they can certainly be more welcoming and less intimidating in design. 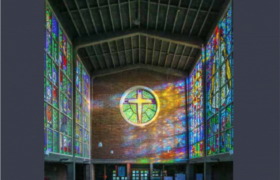 Two recent high profile cases have been our campaigns to protect the work of George Pace at Christ Church Fulwood in Sheffield and Thomas Ford’s 1951 Festival of Britain interior at St. John’s Waterloo in London. Both campaigns were successful but involved C20 going to the Consistory Court of the diocese to fight its case. Catherine said this was a ‘huge drain’ on C20 resources and that unless it could raise more funds for this sort of work, or unless attitudes changed, the future looked bleak. 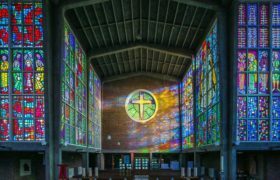 The 100 Churches 100 Years book doesn’t seek to focus on buildings under threat, but rather celebrates the beautiful and extraordinary ecclesiastical architecture of the C20th. But two entries do further illustrate Catherine’s concerns – the Grade II listed St Leonard Church at St Leonards-on-Sea in East Sussex and St Peter’s Seminary at Cardross in Argyll. The Grade II listed St Leonard’s Church (1961) is a rare collaboration of the brothers Giles and Adrian Gilbert Scott and replaced a Gothic chapel by James Burton which was bombed in WWII. Because of fears that the cliff behind it is unstable, the church is currently closed, and the joys of its interior – with its stunning Reyntiens glass and maritime theme – are hidden from view. The pulpit is (literally) the protruding prow of a fishing boat, the lectern a reused binnacle (ship’s compass), the blue-grey Hornton stone around the walls is capped with a sprightly carved wave motif, and there are very realistic inlaid fish on the chancel floor. We have visited with the archdeacon and church commissioners, and are disputing their pessimistic interpretation of the building’s structural problems. St. Peter’s Seminary is the only building in the book which is probably better known for its history of dereliction than as a working religious settlement serving its original purpose as a training college for Catholic priests for only 14 years after completion in 1966. The diocese’s approach to priest recruitment and training shifted fundamentally as it was under construction, making it virtually redundant from the very beginning. We hope that the recently stalled scheme for rejuvenation will still manage to save this masterpiece. During this period concrete and steel gave a new freedom to construction, while new ideas about how congregations could participate in services changed assumptions about traditional layouts, bringing celebrants and people closer together. The century saw dynamic churches in dramatic shapes of all sizes thanks to ambitious engineering, and brilliant colour from new forms of stained glass, murals and sculpture. Architects whose work is included in the book range from Basil Spence’s Coventry Cathedral of 1962 to Giles Gilbert Scott’s Liverpool Cathedral in 1978. Alongside the more famous churches, there are more recently built churches, such as the light-filled Bishop Edward King Chapel of 2013. The book provides biographies of major designers; articles on glass, fittings, and on the synagogues, mosques and temples that play an intrinsic and important part in worship in Britain today. Contributors include architectural historians Elain Harwood, Alan Powers and Clare Price. Published by Batsford and edited by Susannah Charlton, Elain Harwood and Clare Price, the book is part of the series which includes 100 Houses 100 Years, 100 Buildings 100 Years, 50 Architects 50 Buildings. It is priced at £25.